Pittville Badminton Club is a friendly, sociable and ambitious club, based in Cheltenham, Gloucestershire. We are an accredited Premier (Clubmark) Club and have something to offer junior and adult players of all levels of experience. We run weekly club nights for our members to play socially, coaching sessions (both for juniors and adults) to help players improve and arrange club socials and competitions. 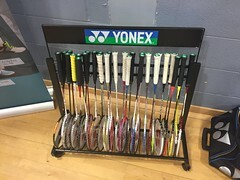 We also provide the opportunity for our members to represent our club in the local Gloucestershire Badminton League and in county junior competitions. In addition to our weekly coaching sessions, there are a number of junior competitions taking place in March. All of them provide a great opportunity to play some extra badminton and test your skills out by playing with players from other local clubs. Next to the name of each event, I've listed which age group the event is targeted at. If you are not sure if an event is suitable for you then please do get in touch and we will be able to advise you. An opportunity for primary school aged players to experience some fun based badminton skills development activities as well as game play. Play doubles games with players from other clubs. Each game will be limited by time, rather than score, to ensure you play with lots of different players. There is a prize for the player who is able to score the most number of points across all of their games. There will be 2 rounds of half court singles games. In the first round, players will be placed into groups and play a game against everyone in their group. At the end of each game the winner will be given the opportunity of taking a raffle ticket with a chance of winning a large Easter Egg or taking a fun size sweet. The losing player will then take the option not chosen by the winner. When round one has been completed players will be re-grouped depending on how they did, and play against everyone in their new group. Winners of each second round group will receive an Easter Egg to celebrate his or her achievement. Hi Everyone, just a quick note to let you know that there won't be a club night on Wednesday (20th February), as Pates are having some work done to the Sports Hall. See you on the 27th! Thank you and well done to all those who represented our club in the Badminton Gloucestershire Junior Badminton League this season. The final results have now been sent through and I've included them below. Well done to everyone - there were plenty of great games this season and I really hope you enjoyed competing and feel like your badminton has improved as a result.